Found in FNA Volume 9. Treatment on page 316. Mentioned on page 313, 314, 317. Herbs, 3.5–15 dm. Roots: tubers absent. Stems with glistening stipitate-glandular hairs and hirsute (hairs scattered, erect, 2 mm). Leaves: mid cauline stipules ± 1/2-ovate, margins incised; major leaflets 3–9 (mid cauline 5–7), minor 1–4, rarely 0–1, pairs; major leaflet blades ovate to elliptic or rhombic, terminal largest, largest of these 2.4–10.5 × 1.4–5.6 cm, margins serrate, apex acute, sometimes acuminate, abaxial surface usually with glistening stipitate-glandular hairs and hirsute (hairs scattered, 0.5–2 mm). Inflorescences: axes with glistening stipitate-glandular hairs and hirsute (hairs erect, 2 mm). Flowers usually ± alternate. Fruiting hypanthia turbinate to broadly campanulate, rarely broadly obconic, 2.3–5.8 × 2.8–6.2 mm, deeply to sometimes obscurely sulcate, hooked bristles in 4–5 circumferential rows, proximal row reflexed, with glistening stipitate-glandular hairs and sparsely hirsute. 2n = 56. B.C., Man., N.B., N.S., Ont., P.E.I., Que., Ariz., Ark., Calif., Colo., Conn., Del., Ga., Ill., Ind., Iowa, Kans., Ky., Maine, Md., Mass., Mich., Minn., Mo., Mont., Nebr., N.H., N.J., N.Mex., N.Y., N.C., N.Dak., Ohio, Oreg., Pa., R.I., S.Dak., Tenn., Vt., Va., Wash., W.Va., Wis., Wyo., Mexico (Chiapas, Coahuila, Nuevo León), Central America (Guatemala). In the mountains of the western United States, Mexico, and Guatemala, populations of Agrimonia gryposepala are widely scattered. The species is absent from the Great Basin. 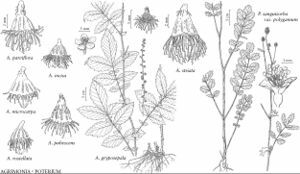 Plants with stems and abaxial leaflet surfaces more densely hirsute and leaflets less than 7 cm are sometimes found in the mountains of the western United States and are the predominant morphs of A. gryposepala in Chiapas and Guatemala. We have seen only three specimens from Coahuila and Nuevo León; the relative occurrence of the morphs there cannot be determined.